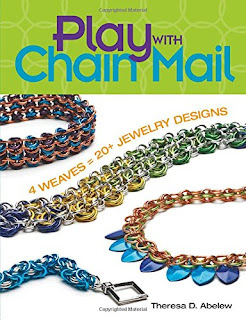 I never thought about it this way before, but Theresa Abelew points out that chain maille is the ultimate recyclable project. If you don't like what you get, take it apart and try again...no waste! If you have been daunted by the dizzying array of jump ring sizes (inner diameter? outer diameter? what???) and weave patterns, then you might be ready for Theresa's new book Play With Chain Mail, published by Kalmbach. The author concentrates on presenting four weaves in their basic formation, followed by jewelry projects which will help you practice each. The patterns covered are rosette or mobius, box chain and Byzantine, European 4-in-1, and Helm chain. Each section starts with the classic chain and then moves onward to more interesting applications. One problem with working on chain maille is that so many different ring sizes can be required. Theresa is mindful of that, and has given you a chart in the back that you can quickly check to see which projects use the same sizes. She has also tried to limit the sizes as much as possible so that you can be sure there will be other projects to use up your leftovers! All the basics are covered, as in all Kalmbach books. Couple this with the chart, the excellent instructions, and the organization of the book, and you've got yourself a really good beginner's book here.